Michael Gardyne rather bamboozles Brad McKay, who winds up sitting on his backside after some neat footwork from the County winger. From the corner that follows, Jamie Lindsay spurns a huge chance to put the hosts ahead. He was completely unmarked at the back post and had time to take the delivery down, but fired wide. The sheer space Lindsay had in the Caley Thistle boss will worry John Robertson. A pretty subdued and scrappy in Dingwall. Ross County striker Billy Mckay gets the first shot of the game, a volley from around 15 yards that soars over the bar and into the away crowd. The former Inverness man is getting plenty treatment from the Caley Thistle support. Quote Message: I could see it ending in a draw tonight. It will be a really good game, fiercely fought. There’ll be an edge to this one. I could see it ending in a draw tonight. It will be a really good game, fiercely fought. There’ll be an edge to this one. Ross County co-manager Steven Ferguson on BBC One: “I think the whole area is looking forward to this. Who will step up with a ‘special’ touch? Quote Message: It’s going to be a tough competitive game tonight and although John (Robertson) says they’ve been the better side, in cup ties that doesn’t count for much. That can change in the blink of an eye with someone turning something a little bit special to separate these two teams and allow one to progress into the quarter-finals. It’s going to be a tough competitive game tonight and although John (Robertson) says they’ve been the better side, in cup ties that doesn’t count for much. That can change in the blink of an eye with someone turning something a little bit special to separate these two teams and allow one to progress into the quarter-finals. Ross County have no fewer than four ex-Inverness players in their current squad. Midfielder Don Cowie began his senior career in Dingwall before crossing the Kessock Bridge and spending two successful years at Inverness. He’s now back with the Staggies after leaving Hearts in the summer. Ross Draper was a Scottish Cup winner with Caley Thistle in 2015. Billy Mckay managed 27 goals in 46 Inverness outings as Terry Butcher’s men finished fourth in the top flight six years ago. And Iain Vigurs is in his second spell with County having had two stints with their Highland rivals. There has been very little to choose between the teams in their three derbies so far this season. A goalless stalemate in September. A 2-2 draw in November. And the appropriately-named Ross Stewart scored an 84th-minute winner for County in their most recent tussle, a 2-1 win on 29 December. It’s Ross County who hold the derby bragging rights for now. They’re on an unbeaten run of seven matches – four wins and three draws – against their Highland foes, stretching back almost three years. Inverness last beat County in March 2016 – a 3-0 tonking dished out in Dingwall. The Staggies are top of the Championship by three points with Caley Thistle 12 behind in fourth place. There’s been a fair bit of Highland history in the last decade of Scottish Cup action. Ross County, in the second tier at the time, dumped out Hibernian and Celtic en route to the final in 2010, where they were beaten by Dundee United. Inverness CT won the cup in 2015 – their first major trophy. Michael Gardyne came off the bench to score Ross County’s winner against Dunfermline Athletic and he is restored to the starting line-up tonight. In the other change made by Kettlewell and Ferguson, Andy Boyle replaces cup-tied Callum Semple. Inverness boss John Robertson makes five changes from his team’s 2-1 loss to Partick Thistle. Mark Ridgers replaces Cammy MacKay in goals after recovering from a back injury. Tom Walsh and Aaron Doran are also fit-again and restored to the starting line-up. Coll Donaldson and club captain Carl Tremarco start ahead of Shaun Rooney and Kevin McHattie in defence. Nathan Austin and Hearts loanee Anthony McDonald drop to the bench. The Ross County dug-out will be minus one of their two co-managers tonight. Stuart Kettlewell will be watching from the stands as he serves a the first game of a six-match ban for “misconduct and making physical contact with a match official in aggressive manner” during County’s loss to Morton last month. That means colleague Steven Ferguson will run the show on the touchline. Fraser, Boyle, Watson, Van der Weg, Gardyne, Spence, Draper, Lindsay, Graham, Mckay. Substitutes: Munro, McManus, Mullin, Stewart, Wallace, Grivosti, Murray. Donaldson, Tremarco, Chalmers, Welsh, Walsh, Doran, Polworth, White. Substitutes: MacKay, Rooney, McCauley, Austin, Trafford, McHattie, MacGregor. Seven down, one to go. 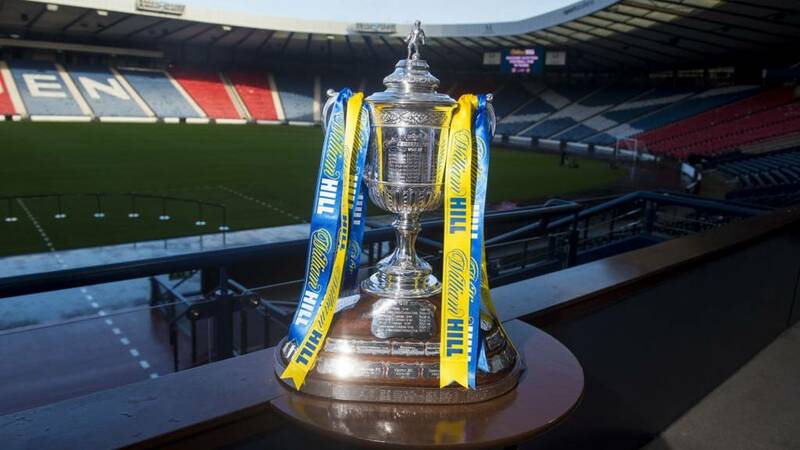 Either Ross County or Inverness CT will be the last team into the Scottish Cup quarter-finals. We’ve got a Highland derby coming your way from Dingwall this evening – live on BBC One, BBC Radio Scotland and right here. Following that and all the post-match reaction, we’ll also bring you last-eight draw.